Financial Services Commission Chairman Choi Jong-ku hinted Tuesday at cutting or removing the securities transaction tax on the Korean equity market and to discuss the matter with tax authorities. 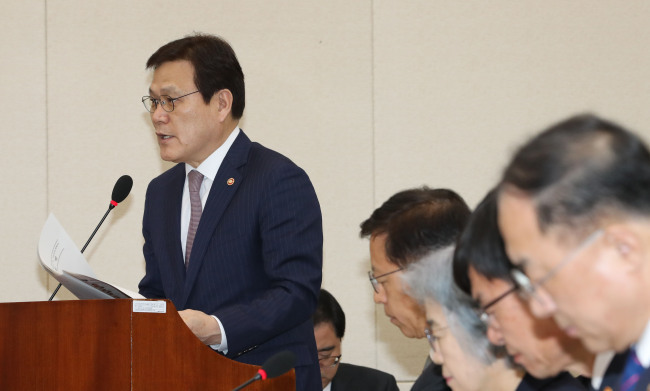 “It’s high time to take (a securities transaction tax cut) into consideration,” Choi said during a session with parliament, in response to a question from Rep. Jeon Hae-cheol of the ruling Democratic Party of Korea. Choi took issue with double taxation potentially caused by the securities transaction, given an anticipated tighter taxation rule for capital gains of equity investors by expanding the target of capital gains tax collection starting 2021. Choi also highlighted that a loss from equity investment does not exempt investors from such taxes here. Choi added that a potential plan for tax relief could lead to a breakthrough in the sluggish stock market. The volume of taxes reported to authorities came to some 4.7 trillion won ($4.2 billion) from investors’ securities transactions last year. There have been growing calls to reduce or eliminate the securities transaction tax, as markets here have experienced a bearish trend on global trade war threats and other external uncertainties. The Korea Economic Research Institute think tank pointed to the global trend of securities transaction tax relief in a report Monday. Under a Korean law, tax authorities impose 0.3 percent per transaction on Korean stock markets Kospi, Kosdaq and Konex. When trading shares of privately held companies, the tax amounts to 0.5 percent of transaction volume. A new bill to lower the rate to 0.1 percent is expected to be proposed at the National Assembly next week.